When marketing any product, the way it looks is just as important as the product itself. A poor looking item will get less attention than another product that looks attractive and well-packaged. Packaging is, therefore, a crucial element when selling your brand to customers. Here we have a fantastic example of unique liquor packaging by Wild Wombat Spirits. This blog will show why this packaging itself is great, and how something similar can help your business stand out more. Simple design: As our previous blogs have stated, using premium promotional packaging can have a number of positive effects on its products. However, this example uses a much simpler look, but will have just as good an impact. These woven pouches give this product a unique look that sure to be remembered by those who pass by. It is a distinctive look that stands apart from traditional packaging. It really expresses the idea that they are a small company who takes pride in providing quality products. Its simple design is therefore sure to stand out to new customers. Additionally, these will be cost effective due to the materials that it is made out of. 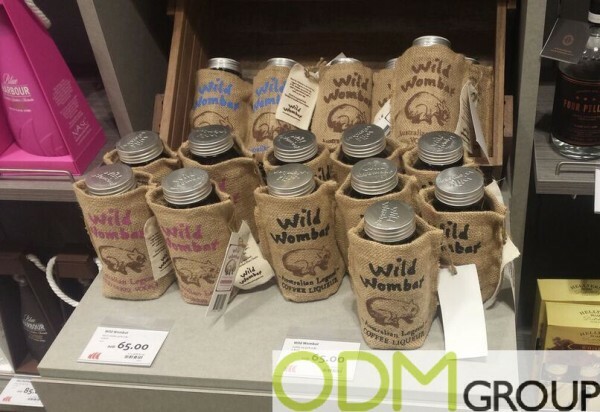 Brand awareness: Products that use custom packaging, like these pouches, are amazing advertising products. These pouches are great to use as they offer a big branding area to print or stitch whatever you want for your customisation. With clear and distinct branding, you can be sure that your brand awareness will increase as your product is exposed to others. Encourage sales: Because your product will become more unique and more appealing to the customers, it will result in an increase of sales. This liquor packaging could be seen as a gift with purchase. This gives added incentive for others to buy it due to the idea that people will receive more for their money. As we can see, this unique packaging can and will have a number of positive effects. Need some ideas coming up with unique packaging for your products? Here at ODM, we have significant experience in product design, sourcing, and manufacturing. We can help you utilise your 2016 marketing budget in an effective manner. Be sure to check out our ever-expanding gift with purchase and in-store display portals in order to find some more similar case studies.